I fried a pound of bacon this morning mainly because one of the girls had a friend sleep over and we’re low on exciting food. Then, after going on a run and hopping in the shower, but forgoing the hair washing, I soon discovered when using the blowdryer to spruce up my hair, that the smell of bacon had fully lodged itself into my hair. At first this concerned me, but I quickly realized if I have to walk around all day with hair smelling like something other than shampoo, it could be much worse than bacon. So I’m rolling with it. In other recent news it is now 12:04 pm and it occurs to me I have thus far today had the strangest assortment of food. A bowl of oatmeal, 2 or 3 slices of the aforementioned bacon (I lost count), some grape tomatoes hastily dredged through hummus which I ate while unloading the dishwasher, and, after I completed that chore and was able to give snacking my undivided attention, I smeared a few pieces of romaine lettuce with hummus and put a grape tomato on top. Lastly, and back to today’s diet, I ate some olives from a gourmet-looking assortment in a plastic tub which I bought on impulse last night at the store. I’m currently slinging all of that back with coffee because, duh. What else? So it’s a good mixture of tastes in there. Probably the perfect palette from which to springboard with Jon to a wine-tasting in Napa but, alas, we’re staying put right here in Northeast Florida tonight to attend the Monster Truck Jam as a family instead. I don’t believe they’ll be doing any sort of wine tasting at the Monster Jam. On the off chance they are, however, I’m gonna go out on a limb and guess it would be from a box, but even that seems a little sophisticated for this particular venue. I’m half expecting to walk into a stadium full of crushed Busch beer cans. Since the evening promises to be highly educational, we’re letting our daughter take a friend. This particular friend happens to ride horses as her sport o’ choice so I’m a little nervous that our evening entertainment will be a shock to her system considering the equestrian crowd she’s used to but, much like how this odd mixture of flavors rolling around in my mouth has turned out to be quite the delight, I’m feeling optimistic about the possibilities. While we did spot a lot of beer and also fruity-looking drinks with straws for which they were charging outrageous prices, we got to see this when we made it to our seats. 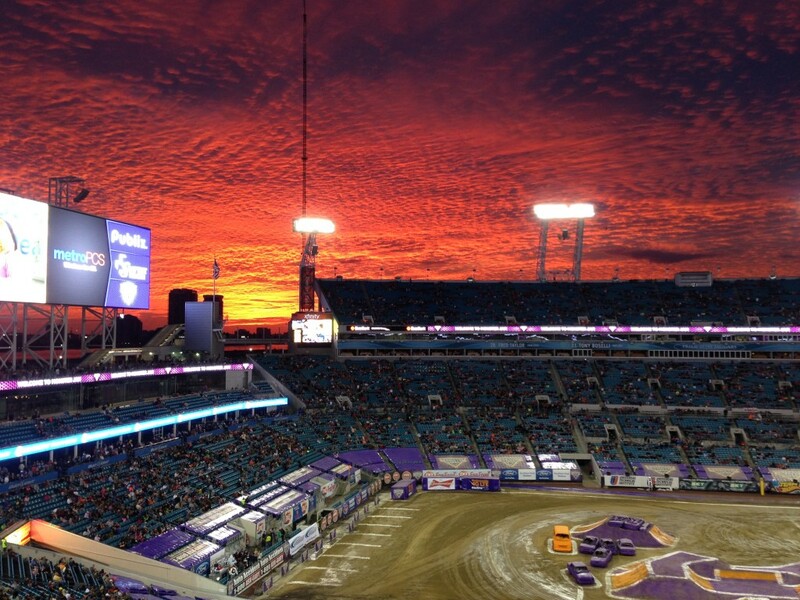 Clearly, even God showed up at the Monster Jam. Also, Jon would want you to know he used no filter. Whatever that means. My take on the Monster Jam is this: it’s a once-in-a-lifetime thing unless you’re interested in perhaps pursuing a career path of this sort. We got bored fairly quickly. For one thing, only two trucks were on the field at a time. I’d previously had visions of a dozen or more wheeling it up all over the place, tromping over crushed cars and narrowly missing each other on the way back down, maybe even crashing into each other, but, instead, it was extremely organized and seemingly very safe. Our daughter and her friend rooted for the only female driver whose truck was called M.M Dalmation. (Much like babies, monster trucks are given names. Razin’ Kane, Captain’s Curse and some other name involving a curse I can’t specifically recall. Unlike babies, however, they have paint jobs and accessories to go along with their name to enhance their image.) M.M. Dalmation had a red rubber tongue dangling down from the hood and was predictably white with black splotches all over. Once she was out of the running for the victory it was downhill for us from there, only providing a fleeting spark of interest when one of the trucks completed a 360 degree somersault against a container. 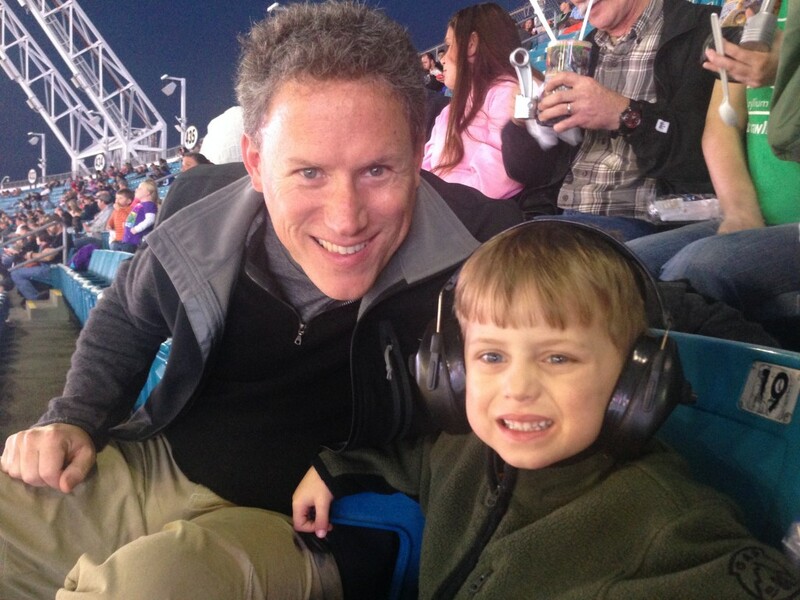 Our son seemed to enjoy it though, dutifully wearing his headphones without complaint except for when men started going up and down the stands selling cotton candy with a rubber truck hanging from it. It felt like Disney. You pay a boatload just to get in and then feel guilty for not buying your kid the world once you’re there. It’s a trap I tell you. Needless to say, with the smells of engine fuel, boiled peanuts and now this teeming from the stadium, my bacon-smelling hair turned out to be a nonissue. And the decision to not get back into the shower upon discovering it? Wisdom. All in all, it was a good day and, although this certainly wasn’t the Napa jet-setting crowd, I much enjoyed getting out of the house and taking in all the various versions of camo clothing the manufacturers are making these days. And while I have no idea what the acronym stands for, I have to give it up for our fine city because I never felt un-S.A.F.E. the entire evening. Not even for a moment. If you enjoy reading here would you do me the kind honor of letting your friends know? If you’d like your Facebook and/or Twitter friends to see this be sure to select the appropriate checkboxes right next to the “Post Comment As” button. This would be a huge help to us in spreading the word. We look forward to hearing from you!